Tell me a little bit about yourself, about your life? Where did you go to school, and what classes did you study? What helped prepare you to become the artist that you are today? I’m French, I’ve been living in Los Angeles with my wife and kids for over a year now, and have been working with Illumination Entertainment for 5 years. I got the chance to work on Despicable Me via Pierre Coffin and MacGuff, and then met Janet Healy, Chris Renaud and Chris Meledandri. It’s an exciting adventure for me since I had never worked with an American team before. It’s also been a bit strange at times; my English is very limited so any ideas that I need to express have to be done so via my drawings. What I really enjoy about this experience is that contrarily to French films that are often mostly centered around a writer/director’s vision, these pictures are the result of a real collaborative effort where everyone’s pitching in ideas. I started out studying Applied Arts, in advertising to be specific, then worked in advertising for five years… Thankfully I had time on the side, using modeling clay to work on short animation films with a friend. I then worked as a designer with Fantôme Animation for six years, on the series Insektors as well as other projects. I ended up becoming a freelance storyboard artist, designer and art director for commercials, TV series and several feature films (that unfortunately never came to fruition due to lack of financing…). How do you go about designing, and what goes through your mind, from start to end? A situation, a gag, an emotion. Most important to me is the visual expression of a story unfolding; I like to set up all of the elements, to create a certain setting in order to highlight the story, that’s really the starting point, the motivation. If I have nothing to say, I do not really want to draw. What is a typical day for you, and who are the people you work with? Drawing! I spend most of my time drawing, and there’s a lot to do as I’m working on several films simultaneously. It’s a solitary type of work, but drawing also helps me settle into the story, giving me time to think about storyline, characters, what the film’s environment will develop into…. Nighttime is also great for thinking about ideas, and even though the day after can be a little tough, I’m always happy when I feel like I’m on to something. I work directly with the directors, Chris Renaud, Pierre Coffin, and now Garth Jennings, and of course with Chris Meledandri who is the driving force behind Illumination. I also work with Yarrow Cheney, Olivier Adams, Colin Stimpson, Clement Griselain, Philippe Tilikite, Michael Defeo, Jérome Gordon, Freddus, Loic Rastout, Paul Mager, Fabien Polack, Zébé… the entire Art Department and department supervisors, the whole Illumination Mac Guff team really, who are all so talented and extremely stimulating from a creative viewpoint. The list is just too long to name everyone; the credits are quite impressive as regards the amount of people it takes to pull these pictures together. Insektors, Kaena, Sam Sam, Etucekoi?, Despicable Me, The Lorax, Despicable Me 2, Minions Movie. Is there a design you have done that you are most happy with? The minions of course, as well as characters I had previously designed for a French series, Etucekoi?, there are in the same spirit than the minions, minus the overalls. There’s a graphic quality to this type of character that I like, somewhat in line with Urban Vinyl for example. 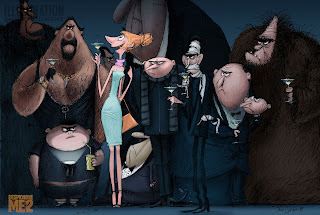 I like their simplicity; in an indirect way they stem from The Shadoks (Jacques Rouxel), The Line (Osvaldo Cavandoli) as well as the Muppets, three series I watched as a child and which were such a source of great joy. I also enjoyed working on an environment much different from my own, during our adaptation of Dr Seuss’ the Lorax for example. Developing the Onceler character was particularly difficult and time consuming; you only ever see the green gloves in the book! I was happy with what we came up with. And then there’s Lucy Wilde in Despicable Me 2 – I don’t think I had ever seen a female character like her in an animated movie before. It wasn’t easy to develop a worthy counterpart to Gru. Since I start designing very early on in the process, while the script is being written, I have the opportunity to offer up my vision of the character. Strangely enough, the design of her car came into existence before she actually did – just like Gru, her car is an integral part of her character. I like to tell myself the story of the character I’m working on; I imagined Lucy as a secret agent doing part time secretarial work (maybe the AVL had budget restrictions and she needed extra income). This explains why she looks more like a teacher or a secretary than your typical secret agent (super attractive and all that jazz) but I find that it makes her more distinctive. When drawing, all sorts of imagery flies through your mind, carrying the idea of this character, helping you carve him/her out. In Lucy’s case, I was inspired by Jane Birkin back in the 60s. I like her mixture of fun, chatty, clumsy and pretty all at the same time. I also thought of Quentin Blake’s Armeline Fouchedru and Jacques Tati’s Play Time, remembering that woman on high heels wearing a tight skirt who walked so quickly and literally hopped up onto the sidewalk. I’m currently at work on the Minions Movie and 2 other films, which it’s too early to discuss. Who are some of your favorite artists out there? Ronald Searle, Jacques Tati, Jacques Rouxel, Christophe Blain, Garry Larson, Schulz, Sempé, Voutch, Bill Waterson , Moebus, Franquin, Miro, Calder ! There are so many…. Could you talk about your process in coloring your art, as well as the types of tools or media that you use? What part of designing is most fun and easy, and what is most difficult? What’s funny is that when an idea does take shape, I rush and draw things so quickly, out of fear that I’ll lose the idea or out of impatience to see what it amounts to, that I often have to start all over again because the drawing isn’t legible to anybody but me! What are some of the things that you do to keep yourself creative? The creative process is pretty strange, and hard to define. I still don’t get how it works. Why sometimes I have ideas, other times none at all, good ones and bad ones… why people like them and why sometimes I’m the only one who does…and why there are other ideas that everybody loves and that I’m not really into. I have a contemplative temperament; I like expressing what I’ve observed or experienced via my drawings. If I’m not feeling like the creative juices are flowing, I’ll delve into books and comics that I enjoy, by Sempé, Ronald Searle, Gary Larson, etc. It’s a real boost of pleasure and good energy. What are some of your favorite designs which you have seen? I don’t have a specific design in mind but several, many by artists I mentioned previously. What is your most favorite subject to draw? And why? I don’t have a favorite subject really. I’m even surprised at times when all of sudden, I’ll have loads of ideas regarding a subject which at first glance wasn’t inspiring at all. They were on TV at night, and we had school the next day again which I wasn’t a big fan of, so they were like a breather to me. There was an absurd aspect to these shows, a particular vision of life, and irony; all that speaks to me and gave me the inclination to recreate and share. What are some of the neat things you have learned from other artists that you have worked with or seen? What wisdom could you give us, about being an Artist? Do you have any tips you could give? Finally, do you have any of your art work for sale (sketchbook, prints, or anything) for people that like your work can know where and when to buy it? … not really, some drawing were sold via the Arludik Gallery in Paris, it may be something we should do again sometime.